Gephi is an open source, cross platform tool which is used to explore, analyze and visualize your network data. It presents data visualization in a state of the art graphical format so in this way it becomes easy to make hypothesis or find out patterns or isolate common structure singularities etc. It can be used for Link, Social Network or Biological Network analysis. This application has gained massive popularity over the passage of time and had been choosen for Google Summer of Code for five consecutive years from 2009 to 2013. Twitter used this tool for their social network traffic analysis and New York Times has also availed this wonderful application for network analysis. The most recent version of this application is 0.8.2 Beta; let’s see how we can run it on Ubuntu Linux 15.04. Download the latest version for this application for Linux operating system from following URL. Once the download process is completed, launch your system terminal and go to the download location, here run following command to extract the downloaded file. Now go into the extracted directory’s bin folder. Here run following command to start Gephi. There you go, it will take couple of seconds on the very first time launch. Start analyzing your data and improving your network flow. 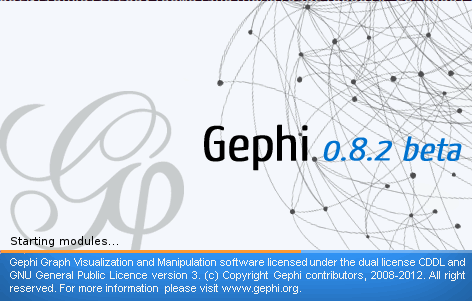 Gephi is a completely free application, works perfectly fine on Windows, Linux and Mac operating systems. It is definitely a very useful tools for advance level analysis and visualization of your data. Go ahead and check out the complete feature list for this application.